Typical readers of top tech blogs revealed! Ben Lang of Wibiya and Sivan Cohen of Conduit have come up with this graphic that neatly sums up the readerships of some of the world’s most popular tech blogs. We think they’ve pretty much nailed most of these, although Pando Daily’s ‘Techie tree huggers’ raised an eyebrow. 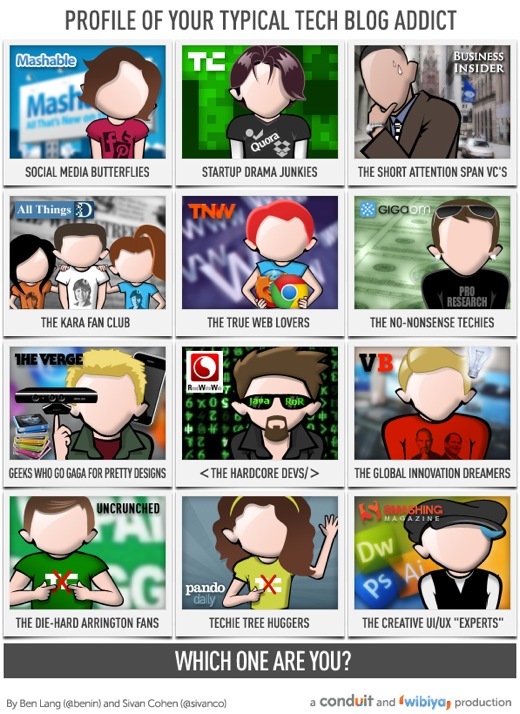 As a The Next Web reader, congratulations – you’re a ‘true Web lover’. If you enjoyed this, try Tech tabloids you are lucky don’t exist.